The island paradise of Trinidad boasts three bands of mountains running east to west. From south to north, these imaginitively named geological features increase in width, breadth, and height from the punty Southern Range to the moderate Central Range to the mighty Northern Range. The Northern Range serves to stabilize the country’s freshwater supply and shelters a terrific diversity of both Caribbean and South American flora and fauna. The latter reason explains why I joined a group of North American birders in an early morning assault on the birds of the Northern Range. 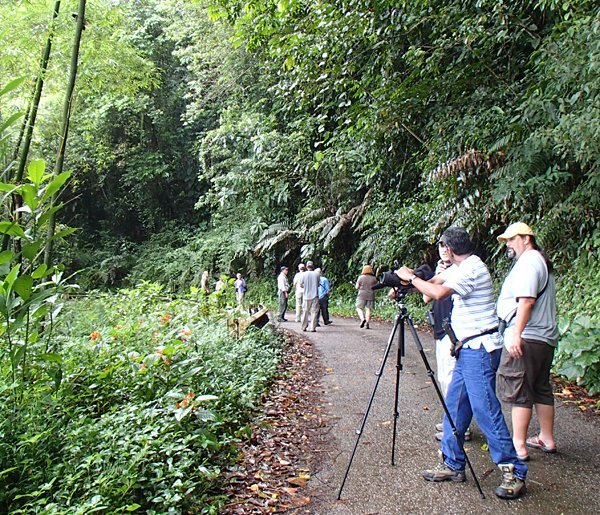 A trip into the Northern Range in the area of Blanchissuese is a staple of Trinidadian birding trips, which means that our excellent local guides and our gracious hosts, Larry and Mark of Caligo Ventures, knew exactly what we were looking for. This meant that, despite inconvenient bursts of rain and gloom, we were able to pick out all kinds of gorgeous birds amidst the lush foliage. The array of thrushes, swallows, swifts, and flycatchers we encountered at these high altitudes wasn’t much different from the ones we saw everywhere else. But Blue-headed Parrots were certainly special, as were raptors like Short-tailed Hawk and Common Black-hawk among the endless vultures. Tanagers in Trinidad are a real treat, especially when crackers like Turquoise, Speckled, Bay-headed, and Swallow turn up with the usual Palm, Blue-gray, and White-lined. I found the Swallow Tanager particularly pulchritudinous and felt lucky that we found it so close and confiding, even though the weather precluded pictures. This bird was almost the best bird of the morning. But a pleasant morning of birding became unforgettable once a bird we gave up on seeing turned up on the scene. I blame Larry, who took pains to prepare us to not see Trinidad’s only non-motmot endemic. 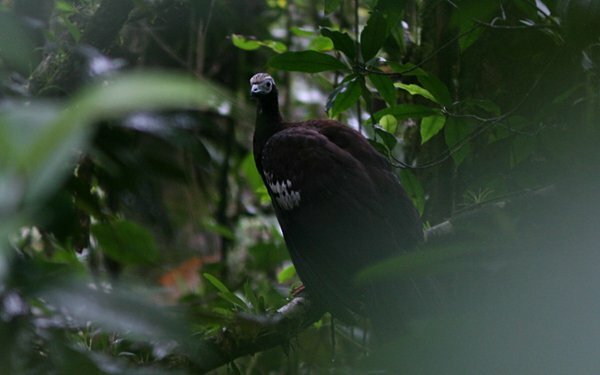 The Trinidad Piping Guan (Pipile pipile), also known as the Pawi, is a big, beautiful cracid. Dark as night with attractive white markings and an electric blue face and wattle, this charismatic tree turkey is close to extinction in Trinidad. As a result, visitors wishing to spy this special bird have to make a special pilgrimage to a rather inconvenient location at an even more inconvenient time of day. Suffice to say, our whirlwind tour didn’t permit a go at the guan. 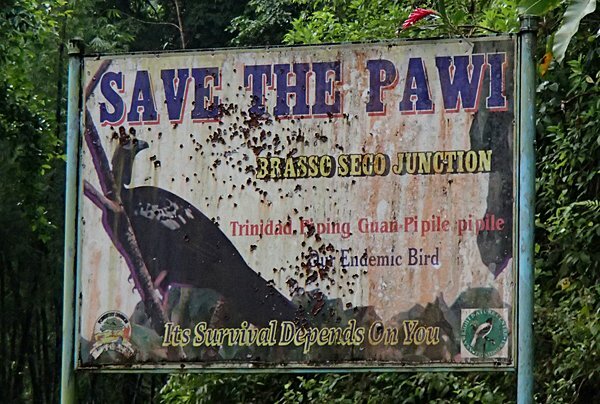 Pawi conservation is somewhat contentious in Trinidad! But Lady Luck smiled unexpectedly on us that morning, as she seemed to do for the full week in T&T. We were about to leave the area when a guide from another Caligo Ventures tour ran towards our group, shouting “Pawi!” A jolt of adrenaline coursed through our congregation as everyone snapped into action. Now let me tell you, friends: I rarely run for birds. But when it comes to guans, I’m prepared to do all sorts of strenuous and ridiculous things. Consequently, I was well-positioned when THE TRINIDAD PIPING GUAN FLEW RIGHT IN FRONT OF MY FACE! A brush that close with a bird so big and so rare has to be one of the highlights of a trip studded with spectacular moments. The Pawi didn’t stick around to sign autographs but instead dove into the dense undergrowth of the slope. Fortunately, we all got good looks through scopes along with merely adequate record shots. I always get my guan! My week-long trip to Trinidad & Tobago was a familiarity trip organized by my friends Larry Lebowitz and Mark Hedden at Caligo Ventures. I will always be grateful to Caligo Ventures for showing me just how phenomenal T&T is! What an amazing adventure! I appreciated your use of “pulchritudinous” to describe a bird, and googled the Swallow Tanager. I hope to see one myself one day! Wow! Nice one to see indeed! What a fantastic thing to happen, Mike! I’m considering going on one of the Caligo Tours, please tell them to arrange for a PAWI to show up without the 3am wake-up call.